Versatile Tabletop Is The Foundation Of Mayline'S Bistro Tables, A Line Of Dining And Bar-Height Tables Ideal For Breakrooms, Cafeterias Or Any Hospitality-Type Setting. Tabletop Features A Thermally Fused Laminate Surface And T-Mold Edging. Attach This Tabletop To The Bistro Cast Iron, Round X Base Or Stainless Steel Square Base To Create Eating And Meeting Areas. Bases (Sold Separately) Come In A Dining Height And A Bar Height To Suit Your Needs. Order Both Base And Tabletop For A Complete Table..
Versatile Tabletop Is The Foundation Of Mayline'S Bistro Tables, A Line Of Dining And Bar-Height Tables Ideal For Breakrooms, Cafeterias Or Any Hospitality-Type Setting. 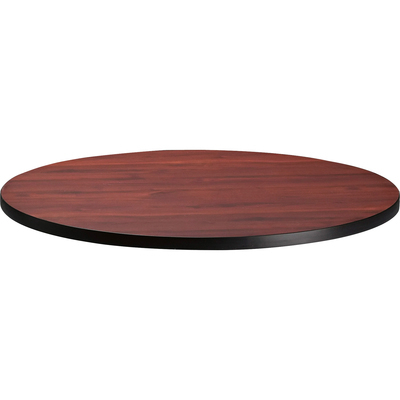 Tabletop Features A Thermally Fused Laminate Surface And T-Mold Edging. Attach This Tabletop To The Bistro Cast Iron, Round X Base Or Stainless Steel Square Base To Create Eating And Meeting Areas. Bases (Sold Separately) Come In A Dining Height And A Bar Height To Suit Your Needs. Order Both Base And Tabletop For A Complete Table.